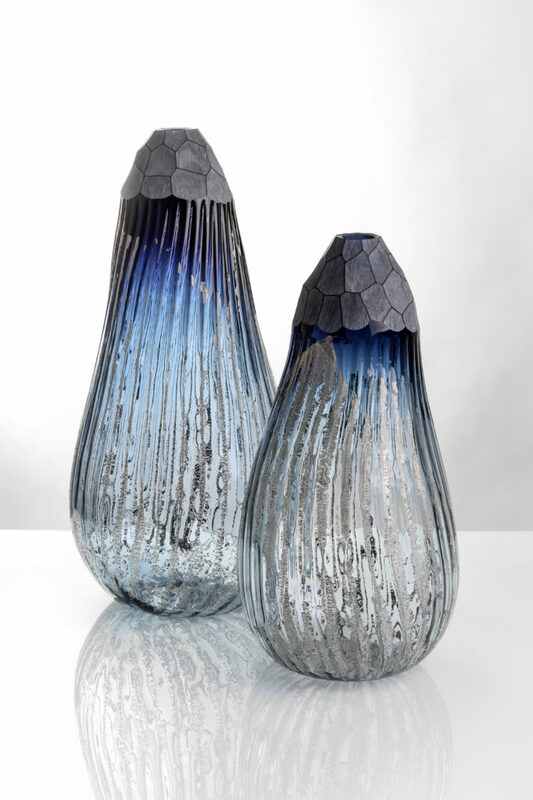 Josef Divín is a notable example of the Czech Republic’s young new generation of glassmakers. His exhibited works are brought to life by a heightened ability to translate both the visual and existential values of nature and atmospheric phenomena. Such values can be observed in a multitude of locations – from the Central Bohemian Uplands, to Brittany in France, to seashores overlooking the world’s oceans… But the manner in which such phenomena imprint themselves into the thoughts and consciousness of Divín is truly unique. Through Landscape, 2018. Fused flat coloured glass with melted silver and painting, metal frame. 48 x 62 cm. Photo: Ondřej Galia. A metaphysical experiencing of landscapes, their horizons, hills, and also clouds, wind, rain; bubbling, flowing water, and the waves of the seas – all of these represent ephemeral moments. Often, observing these natural wonders manifests itself simply as a flash of heightened perception; indeed, such experiences were previously described by the acclaimed 20th century Czech painter Josef Šíma. For any artist, perceptions only gain a sense of permanence through their processing, translation and transformation into manifest visual forms – shapes, compositions, structures, shades, tones, colours, and the emphasising of a particular theme, idea or element…such as horizons of oceans. Such elements are fundamental in Divín’s work. Vessels, 2018. Blown glass with melted silver foil, individually cut by the artist. Height: 65 and 54 cm. Photo: Ondřej Galia. 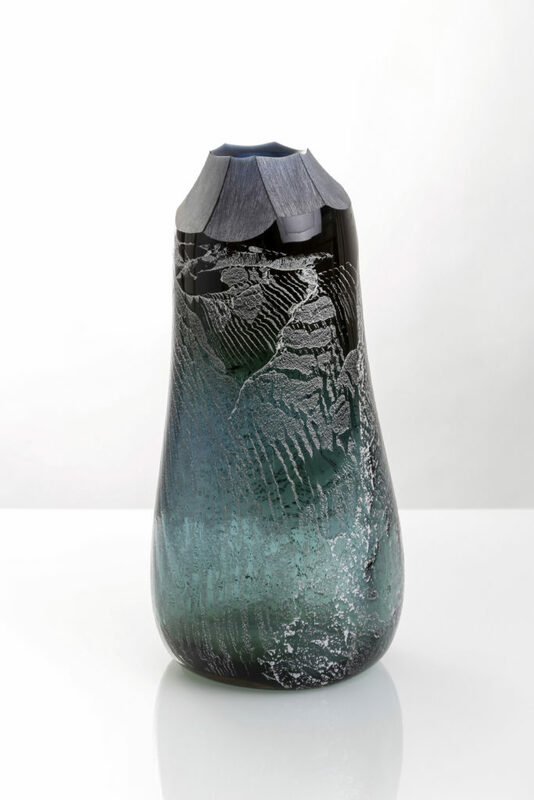 The artist’s interventions adapt flat, moulded, blown, painted, engraved, etched or cut glass. The creation of hand-made spatial objects often requires Divín to work molten blown glass (including preserving the head, or excess glass at the upper part of the blowpipe, which is normally cut off). This is followed by a heat phase of creating structures via the application of silver foil; after cooling, the final objects are fine-tuned, for example via custom cutting. Evening, 2018. Fused flat coloured glass with melted silver and painting, metal frame. 37x 74 cm. Photo: Ondřej Galia. This unrestricted creative process, both in the creation of glass vessels, and in the working of flat fused glass, has yielded a number of melancholic glass compositions, radiating a variety of artistic meanings. Divín has given this collection of works the name Night Sceneries. The works serve as a kind of symbol, enabling Divin’s landscapes to offer a multitude of interpretations and connotations dependant on each observer. Vessel, 2018. Blown glass with melted silver foil, individually cut by the artist. Height: 44 cm. Photo: Ondřej Galia. 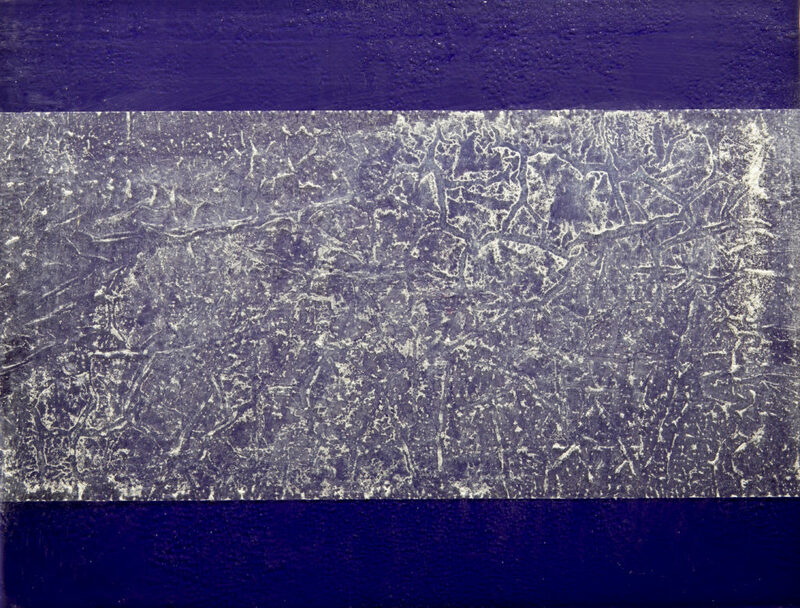 And yet, despite such subjectivity, all observers can undoubtedly appreciate Josef Divín’s unique ability to visualise serenity, harmony, and profound existential experiences, coupled with a converse sense of potential tension – the proverbial “calm before the storm”, as also expertly encapsulated in Japanese paintings, woodcuttings and lacquerware. 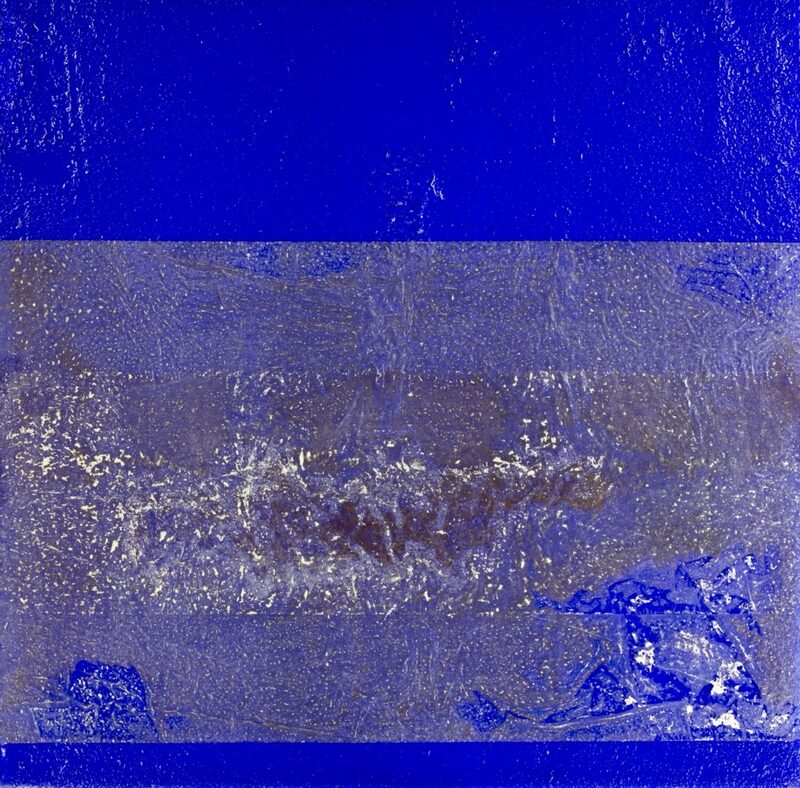 And there are other facets of Divín’s work which could also be described as oriental in nature: adroitness at working in a freestyle, exploratory manner, which yields surprising colour manifestations when light is passed through the artist’s glass works; and a refined sense for creating stylised, silvery decor, based on a heavily guided sense of chance. Contrasts also play a key role. Landscape, 2018. Fused flat coloured glass with melted silver and painting, metal frame. 52 x 66 cm. Photo: Ondřej Galia. 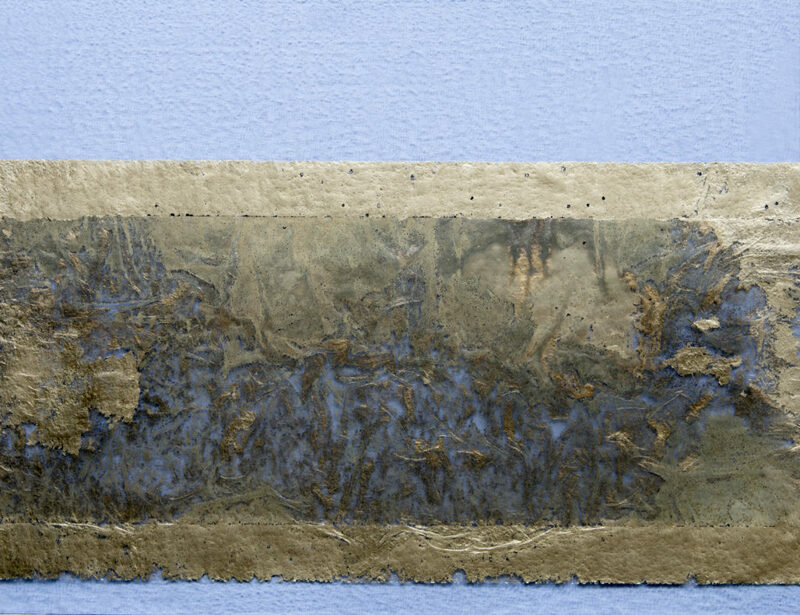 Ultimately, Divín’s expressive compositions, featuring rustic forms and structures, earthly metallic “wrappers”, and dynamic interplays of form and shape, serve as a testament to the artist’s arsenal of skills. As a result, Josef Divín’s artworks have been making waves not just in the Czech Republic, but around the world.